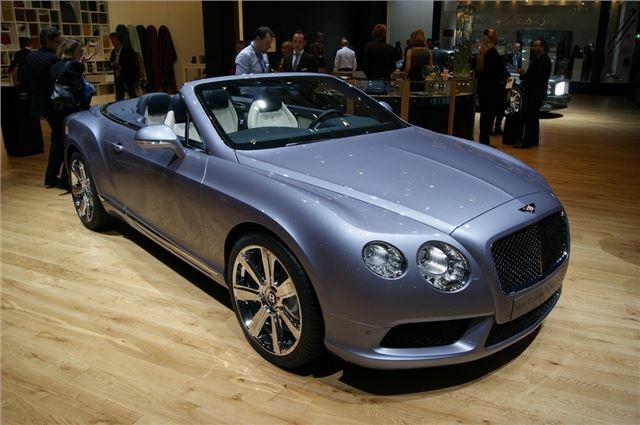 Bentley has officially unveiled the new 'entry-level' model in its Continental GTC range - the GTC V8. Powered by a 4.0-litre engine with 507PS it will sit alongside the W12 and Supersports models and is priced at £136,250. That's more than £13,000 cheaper than the standard GTC W12 yet it still offers all the performance you'd expect from a Bentley with an effortless 0-62mph time of 5.0 seconds and a top speed of 187mph should you decide to take it onto the Autobahn. The V8 has a maximum torque figure of 660Nm which is available across the rev range from 1700rpm to 5000rpm and it is fitted with a new close ratio eight-speed automatic gearbox. It's economical for a Bentley too with claimed average fuel consumption at 25.9mpg. The W12 GTC averages just 17.1mpg. Emissions are considerably lower too at 254g/km of CO2 compared to 384g/km in the W12. This means the new V8 can travel more than 500 miles on a single tank. The engine is fitted with an advanced engine management system, that switches from a V8 to a V4 when you're light on the throttle, saving fuel. The engine also has high pressure direct injection, low friction bearings, thermal management, energy recuperation and an innovative turbocharger packaging, all designed to improve efficiency. The new V8 models also have a state-of-the-art, all-wheel drive system employing an advanced Torsen differential and a 40:60 rear biased power split. To make them stand out, both new V8 models come with a black gloss matrix grille with a chrome surround, a red enamel Bentley ‘B’ badge and a black three-segment lower front bumper. At the back there are unique chromed ‘figure eight’ exhaust tailpipes, a dark lower valance and red enamel ‘B’ bootlid badge. They also get 20-inch alloy wheels as standard with an optional 21‑inch six-spoke design available in Diamond Black (exclusive to the Continental V8) or Diamond Silver finishes. Inside the cabin, an Eliade cloth headlining, new contemporary Dark Fiddleback Eucalyptus veneers, optional two-tone leather colour split and short centre console continue the sporty design theme.